Bjorn Lomborg has an excellent column today on the forthcoming (extensively leaked) IPCC Fifth Assessment Report on climate science. 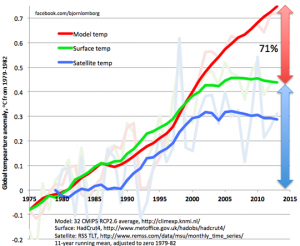 Especially valuable is Lomborg’s chart based on a commentary (“Overestimated global warming over the past 20 years“) published in the monthly journal Nature Climate Change. 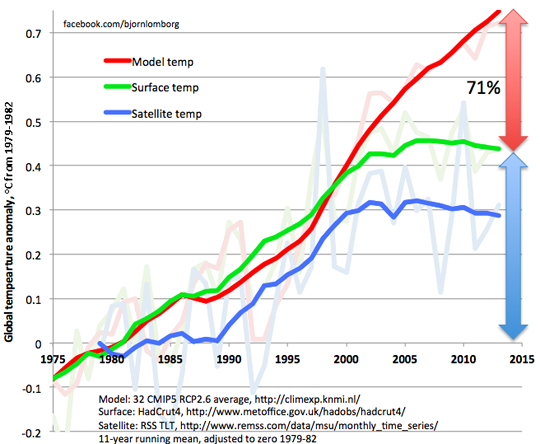 Compared to the actual temperature rise since 1980, the average of 32 top climate models (the so-called CIMP5) overestimates it by 71-159%. A new Nature Climate Change study shows that the prevailing climate models produced estimates that overshot the temperature rise of the last 15 years by more than 300%. Previous post: EPA’s Carbon Pollution Standard May INCREASE CO2 Emissions!